I believe I can fly. It's finally here – the tablet from HTC. 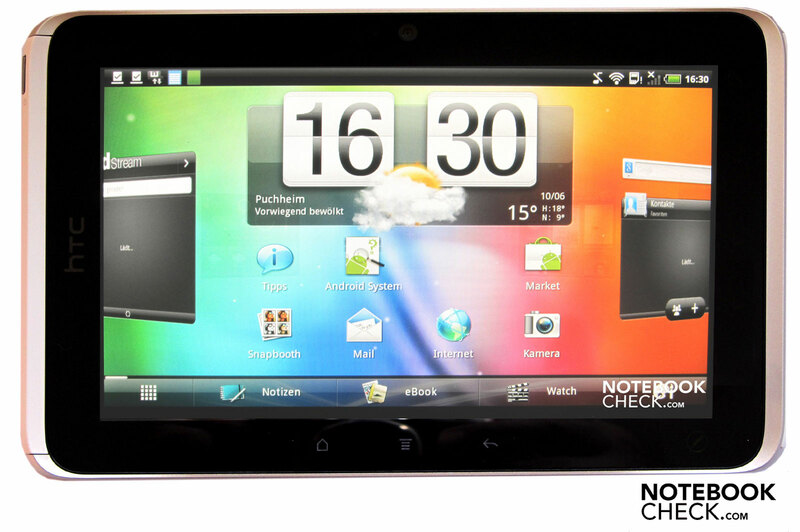 The new device is called Flyer and has a 7 inch touchscreen that can display a resolution of 1024x600 pixels. A single core CPU with a system clock of 1.5 GHz does its work inside. 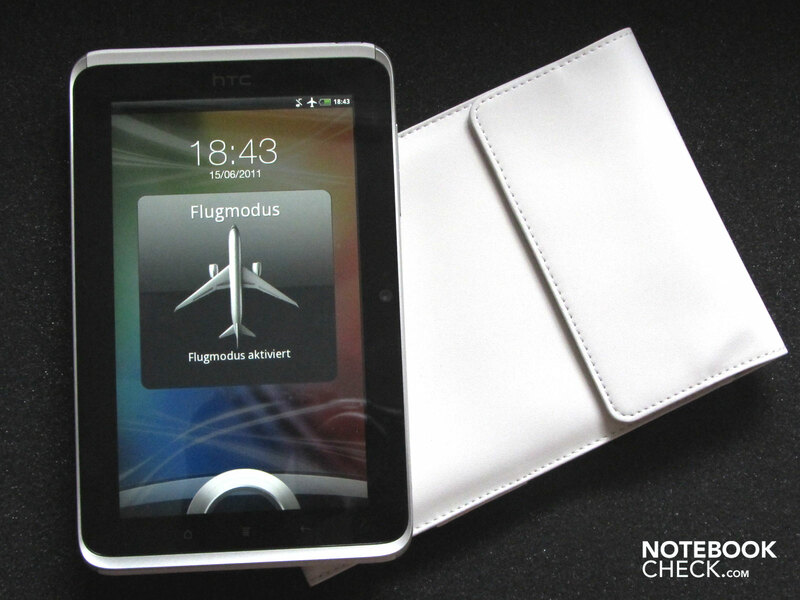 Can the HTC Flyer for a high price of 670 euros stand up to the competition? The small, slim HTC Flyer almost looks like an Apple product. Silver, white and black make up the device's basic colors. 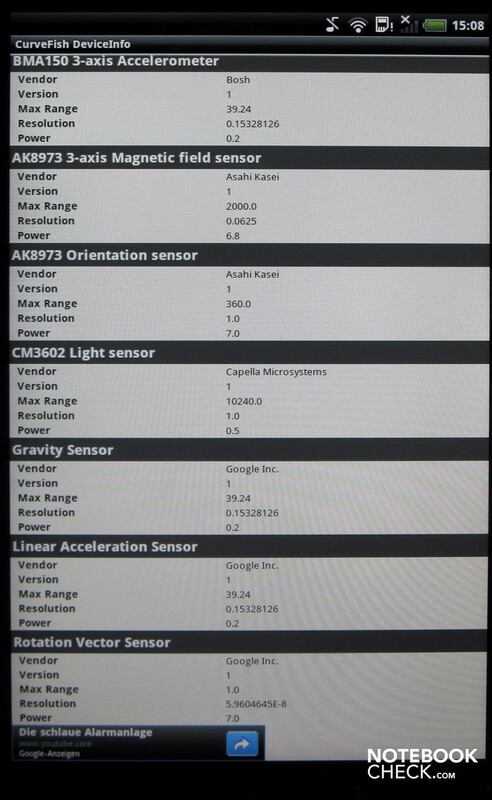 HTC hasn't yet equipped its product with the latest Android 3.0 Honeycomb in terms of operating system. Instead, Gingerbread runs on the tablet. The Taiwanese manufacturer thus still relies on Android 2.3.3 at the moment. 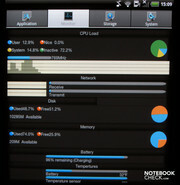 However, it has a modified HTC Sense surface. 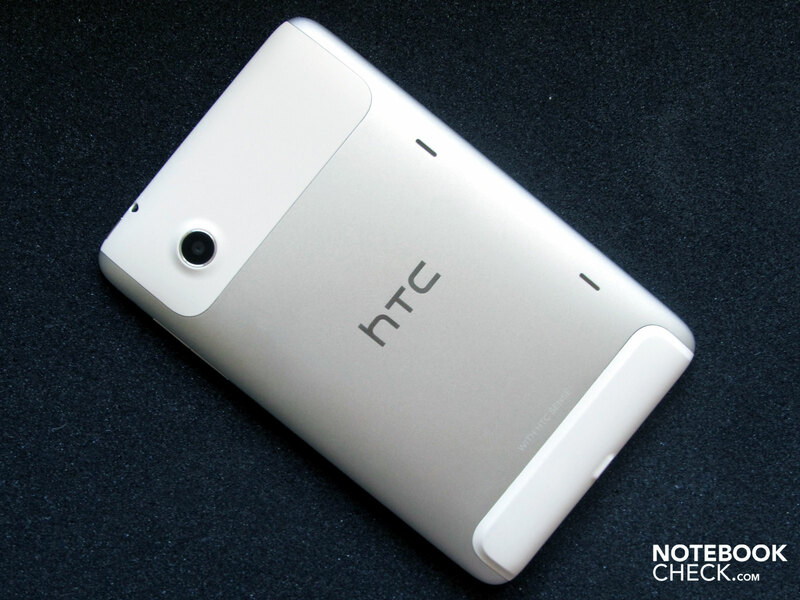 An update to Android 3 is to be available for the HTC in the near future. HTC also does its own thing in terms of processor. 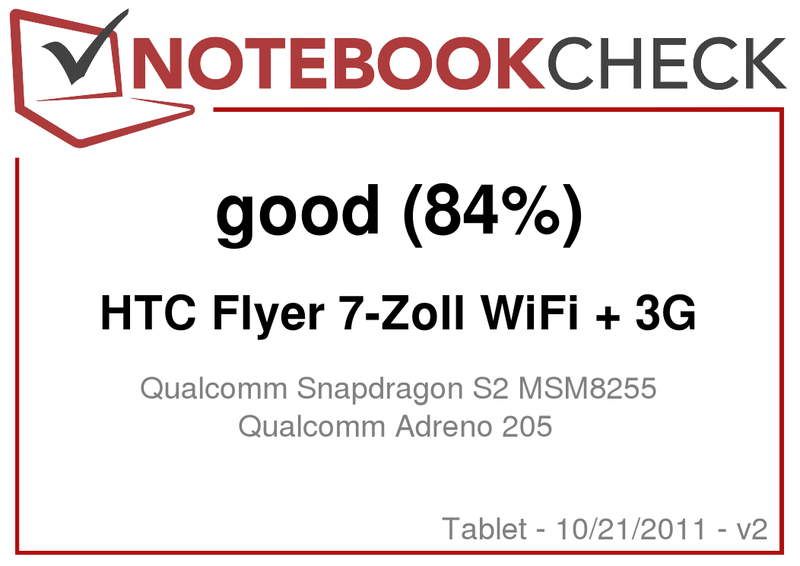 While an Nvidia Tegra 2 processor was installed into most test devices that Notebookcheck had reviewed until now, HTC uses a Qualcomm Snapdragon MSM8255 for its Flyer. This CPU runs with a maximum clock rate of 1.5 GHz. 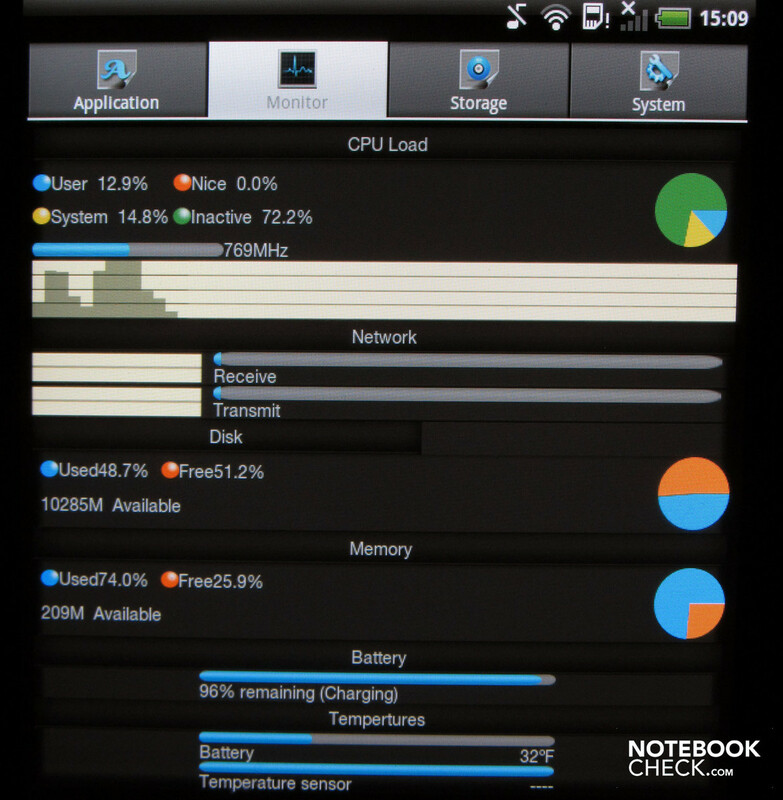 The CPU is also responsible for the tablet's graphics output. As it's appropriate for a 7 inch tablet, the HTC's dimensions are also quite handy. 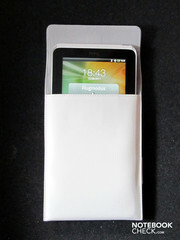 The device fits in every jacket or pants pocket with 12.9x195x125 mm (height x width x depth). However, you should be careful to not accidentally sit down on the device in the latter alternative since the case isn't that stable. 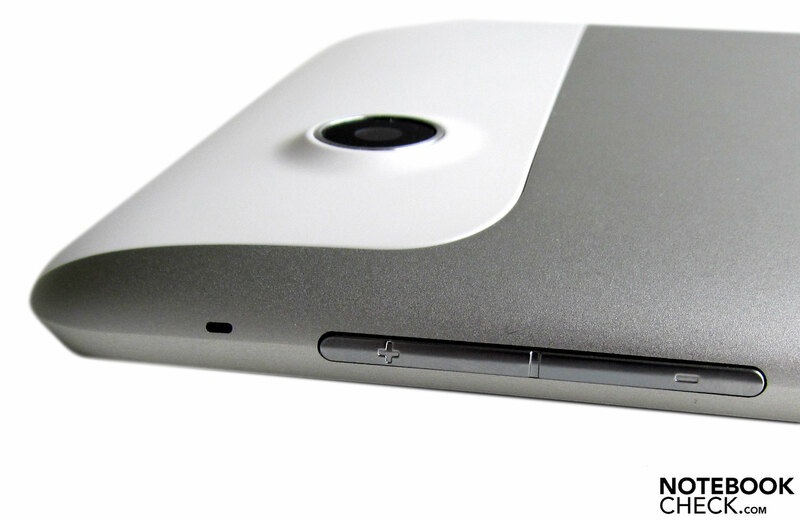 The HTC Flyer is composed of an aluminum unibody case that has been shaped from one block. 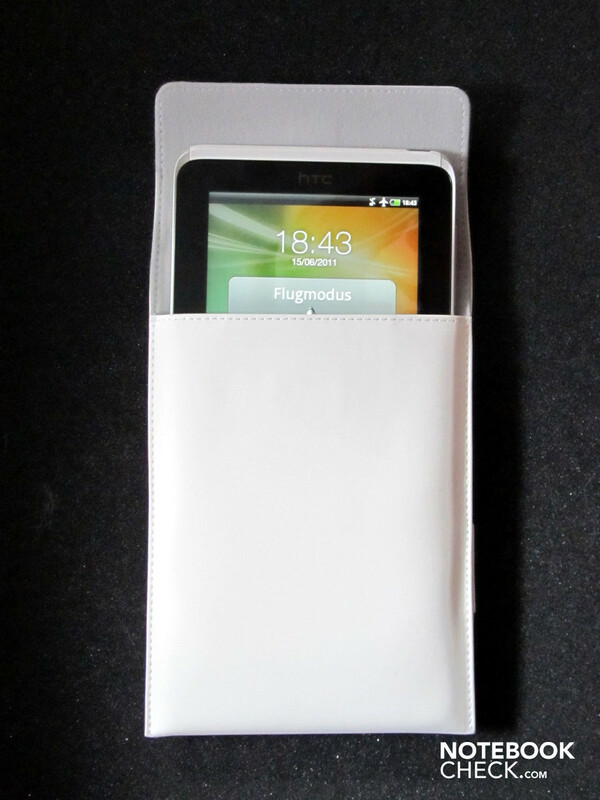 The case is made of three parts: the 7 inch display (17.78 cm display diagonal) on the front, two plastic parts and the aluminum unibody case. The case weighs about 430 grams and doesn't feel heavy after longer use. Thus, the HTC Flyer is a bit heavier than the Ziio by Creative, but roughly 25 grams lighter than the Streak 7 by Dell in terms of weight. The case's workmanship isn't that great. It creaks practically everywhere at the material transitions, even when we only apply light pressure. HTC hasn't provided the Flyer with much in terms of the interfaces and external controls. A laterally placed USB port, a headphone socket and two keys for volume control are the first things we see. On the one hand, the built-in battery is charged via the USB port. On the other, the port also serves the Flyer as an interface for data exchange. 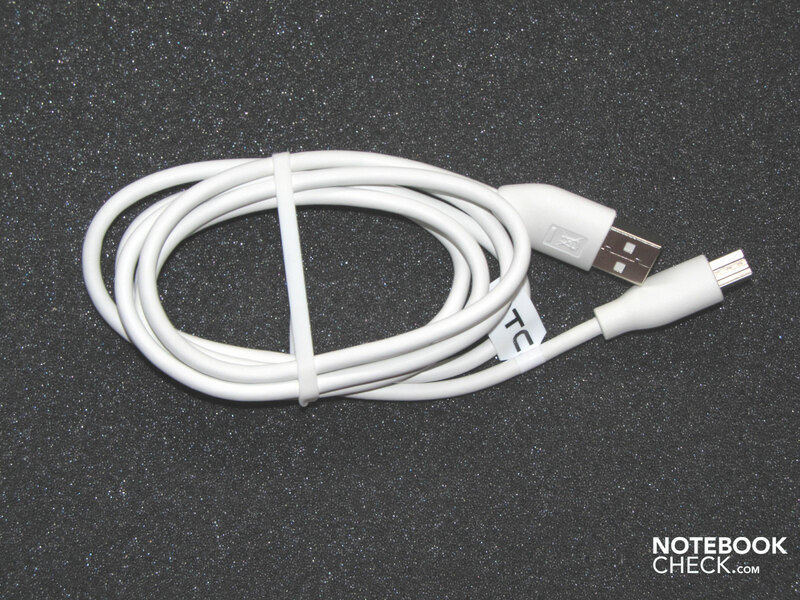 The included data cable can also be used as a charge cable with the PC or notebook. Both Windows 7 and Vista detect the data drive without difficulties. The transfer rate is far beneath the anticipated USB 2.0 transfer rates, but it could be worse. 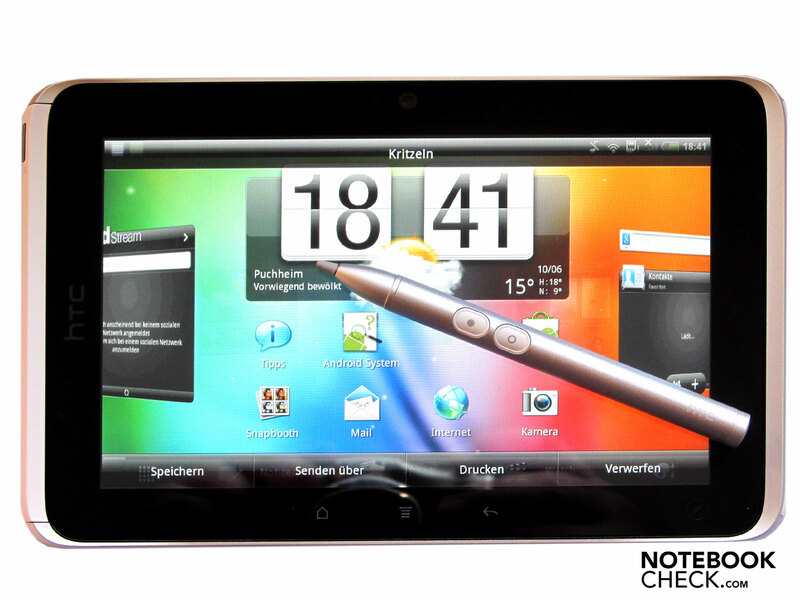 Transferring data, pictures and videos is faster than with the Motorola Xoom in the test. Nevertheless, the data transfer was very elongated particularly with larger amounts of data. Bigger video files should preferably be shared via a microSD card by means of an external card reader. 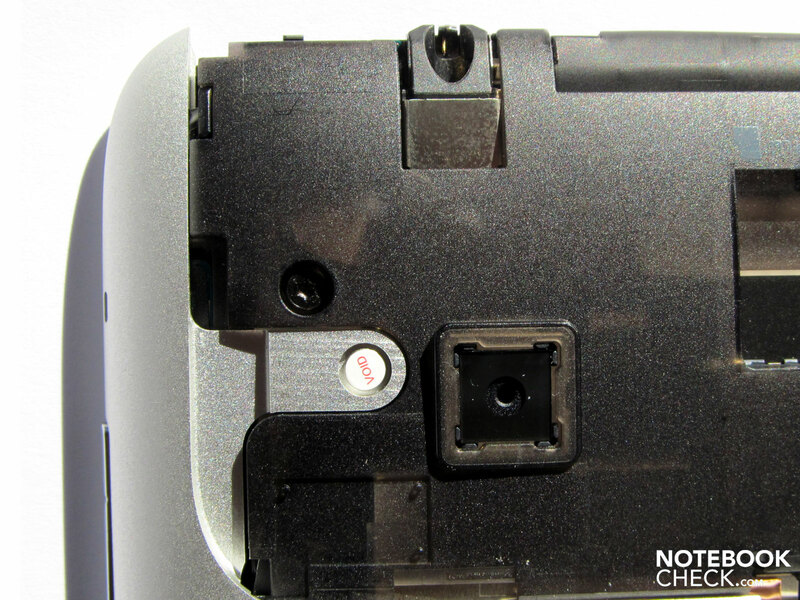 The slots for the microSD card and for a SIM card for mobile Internet access are found beneath the plastic cover on the flipside – where the digicam is also located. Removing the cover is a bit tricky. The instructions for this aren't of much help, so you will have to try a bit until it opens. After all, you don't want to destroy your HTC right away. Opening is fairly easy when you get the trick. Closing it is easier. The lower area on the flipside can't be removed and thus doesn't reveal any other interfaces. The HTC Flyer has Wireless LAN (WiFi) standard IEEE 802.11 b/g/n and Bluetooth 3.0 for communicating with the world. A SIM card can be inserted for Internet access in the models with WiFi + 3G. GSM, 3G and HSPA in the bandwidths 850, 900, 1800 and 1900 are supported. All connections can be disabled via a hot key and thus put the Flyer in the flight mode. The PC's Internet connection can also be shared via HTC software. Data is transferred via the USB cable. 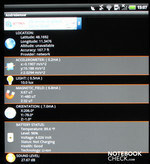 The HTC tablet can also be utilized as a modem for an access point (tethering). This allows other computers or tablets to use the Flyer's 3G Internet connection. 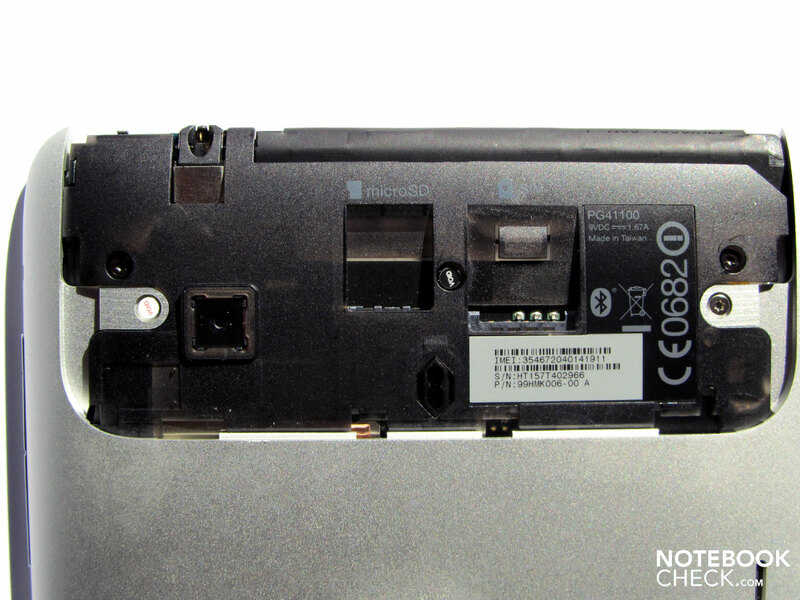 A GPS receiver is also installed into the Flyer. 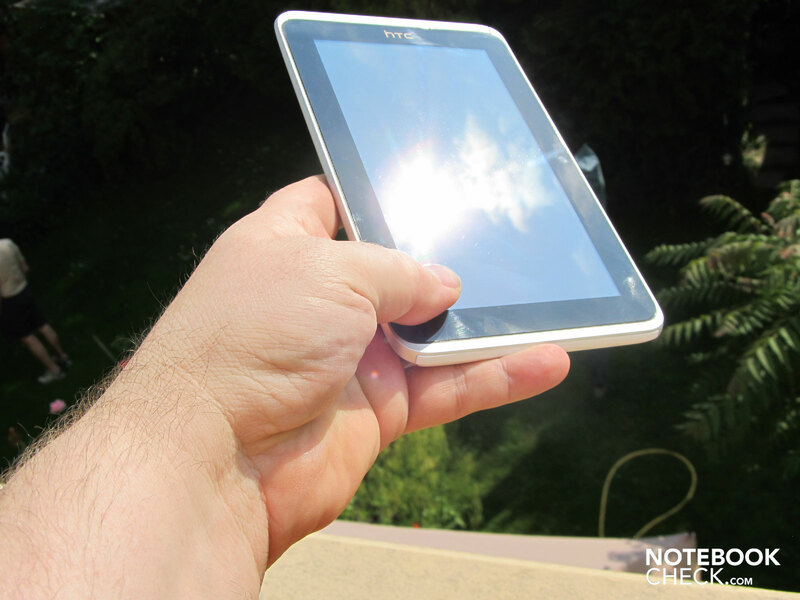 It turns the tablet into a navigation device. The GPS data can be used with Google Maps or the installed navigation software, among others. The maps have to be downloaded before initial use in the latter case, though. As in a "genuine" navigation unit, the synthesized voice can be selected. 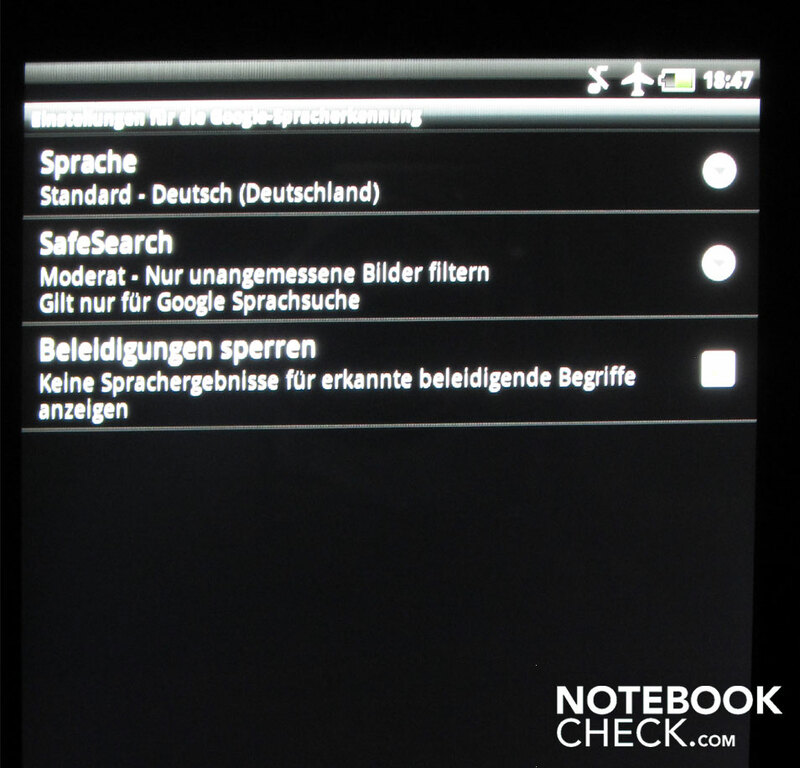 Several languages can be installed on the HTC Flyer – all with a feminine or masculine voice. 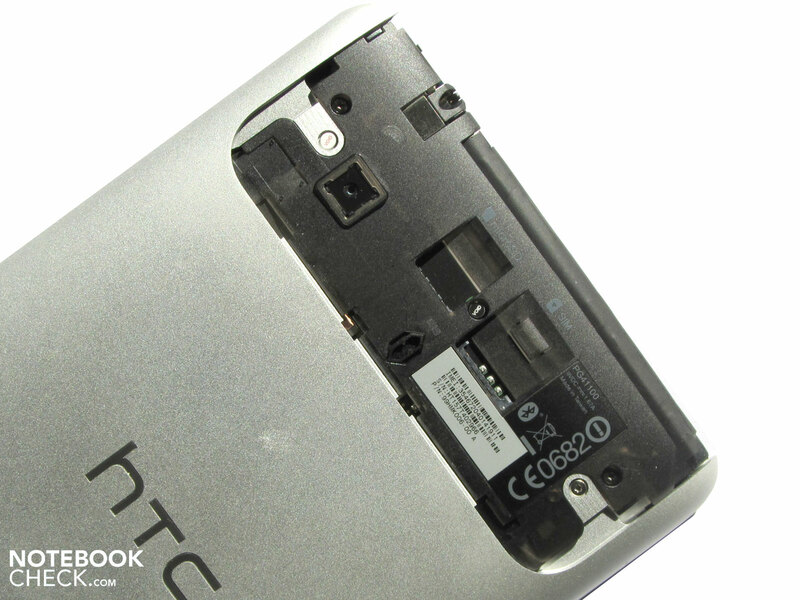 Two cameras are also built into the HTC Flyer. The webcam that is located above the display in the center has a resolution of 1.3 megapixels and has been mainly conceived for chats. 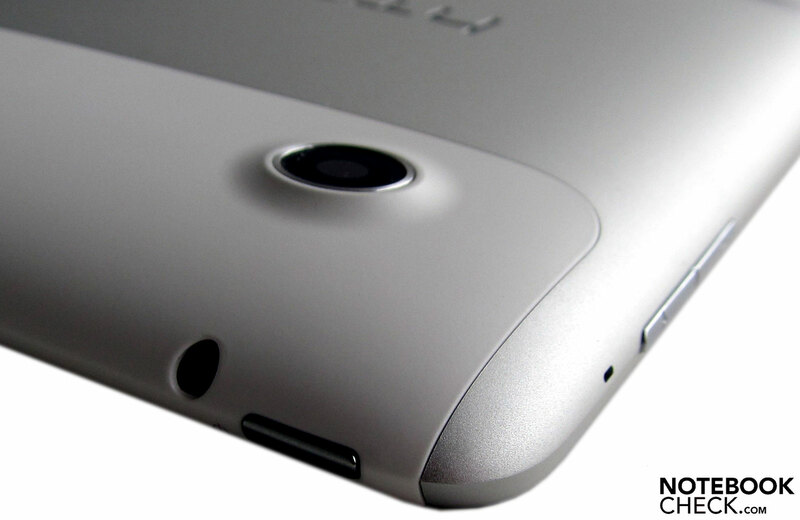 A 5 MP camera with digital zoom is found on the flipside. The digicam doesn't have a flash. The digicam is controlled via the 7 inch display, whereas more than 90% of the display is available as a preview window for the photographer. The pictures can be saved in various quality levels, between small (640x368) and 5 megapixels (2592x1520). 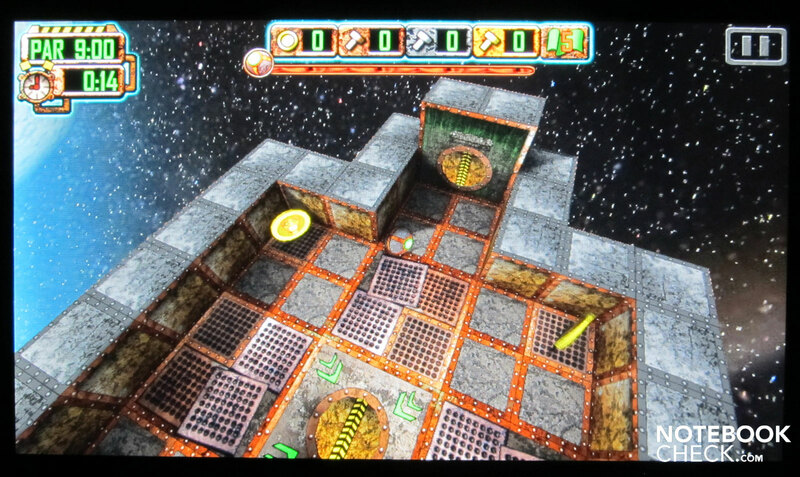 The video quality can be set between 720P and MMS (176x144). The video clips are saved in 3GP format. One minute in maximum resolution is about 60 MBs. 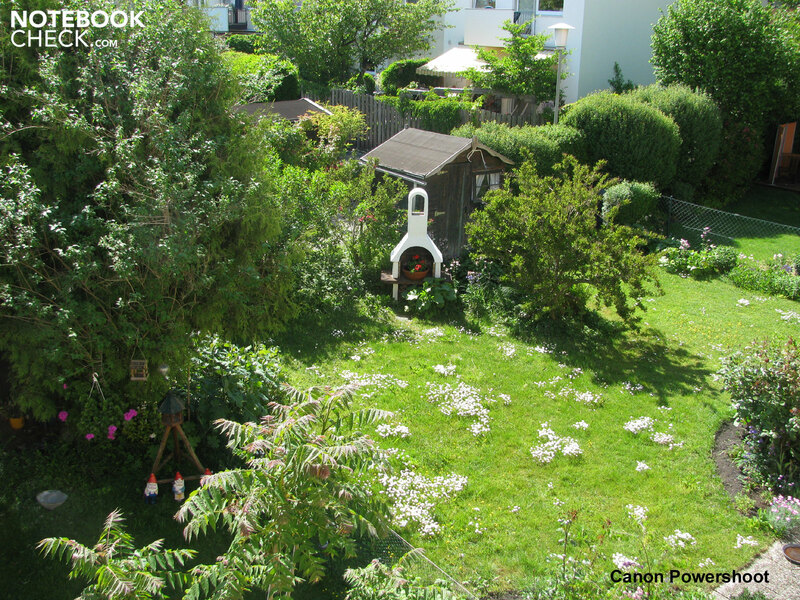 Both sample pictures show the same scene, one with and the other without digital zoom. The second picture's zoom factor was set to 3.8 times. 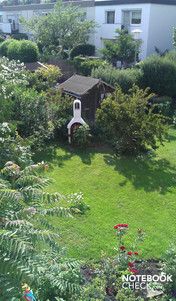 You can see the same picture taken with a Canon Powershot camera for a direct comparison. There is nothing awe-inspiring about the supplies that come with the Flyer. 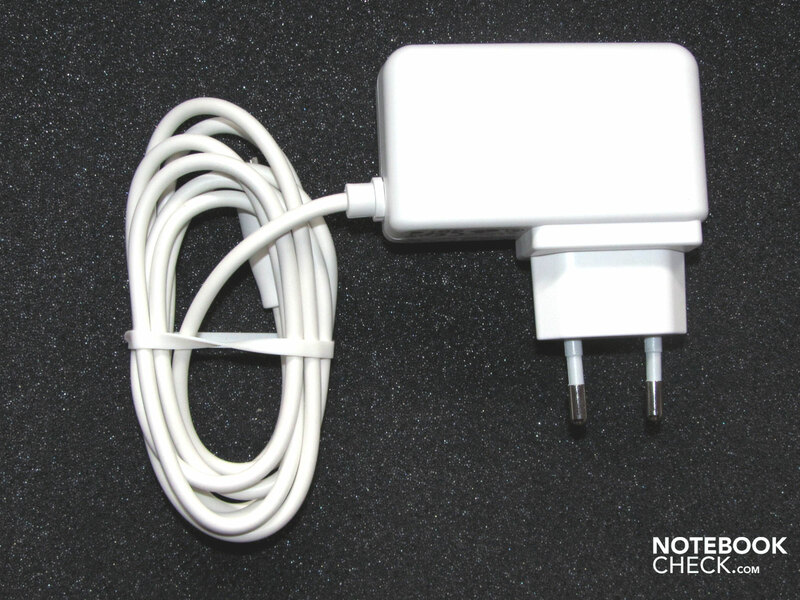 First you'll find the battery charger and then there is a USB connection cable. There is also a bit of printed material in the box. A comprehensive manual is found in the device's memory as a PDF file. In addition, there is a headphone and a "Magic Stick". This digital stylus is a new HTC innovation because you can sketch, draw, write and edit pictures directly on the display. HTC states a warranty period of 24 months. It can vary in different countries, depending on the statutory regulations. 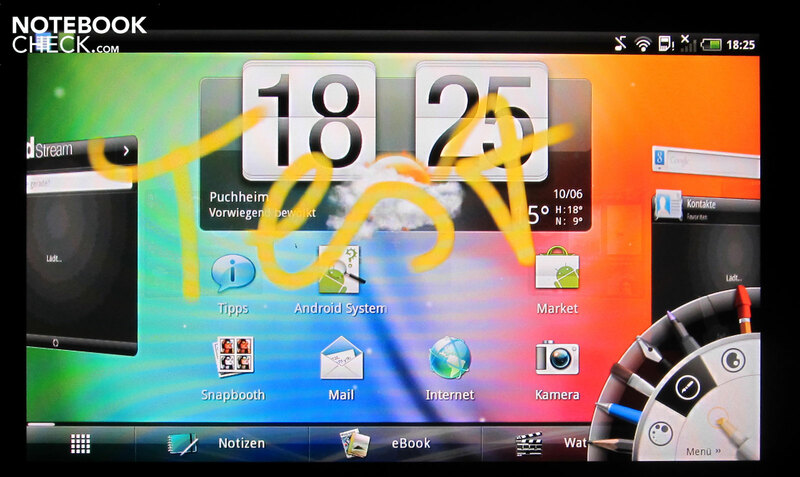 The HTC Flyer's control will usually be over the 7 inch display. The applications are started and controlled via touch. 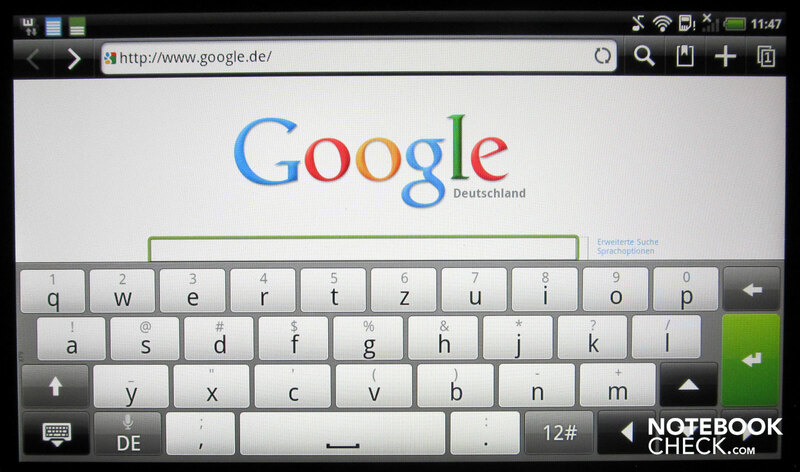 A virtual QWERTZ keyboard is faded in on the screen. This keyboard however doesn't include any German umlauts and, unlike our Dell test device, doesn't support any swipe inputs in state of delivery. Alternative add-ons for the keyboard bid more convenience. They can be – partly for free – downloaded from the Android market. Composing emails, making notes or entering an URL in the browser works quite well. We didn't notice a delay between touching the screen and execution. The actions are implemented immediately. 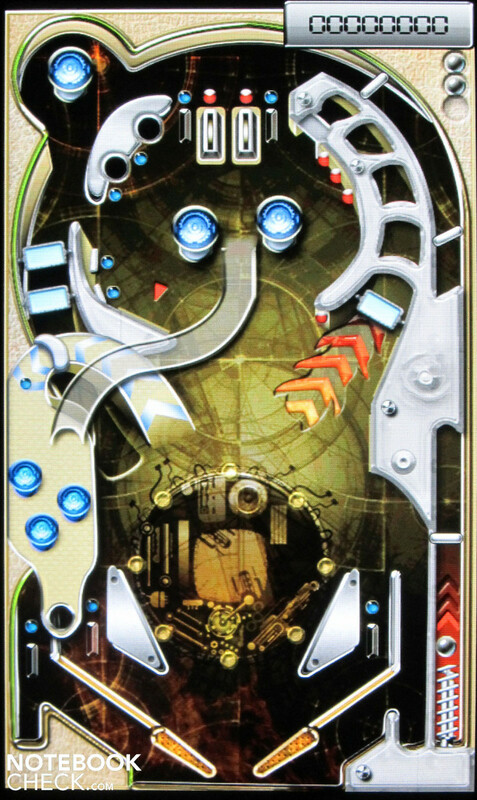 There are various controls on the device. One lets you turn on the HTC tablet and another is for volume control. These buttons are found on the device's upper left. HTC has cleverly solved the three control fields for Home, Back and Options. They are implemented twice on the unit and useable depending on the tablets position. 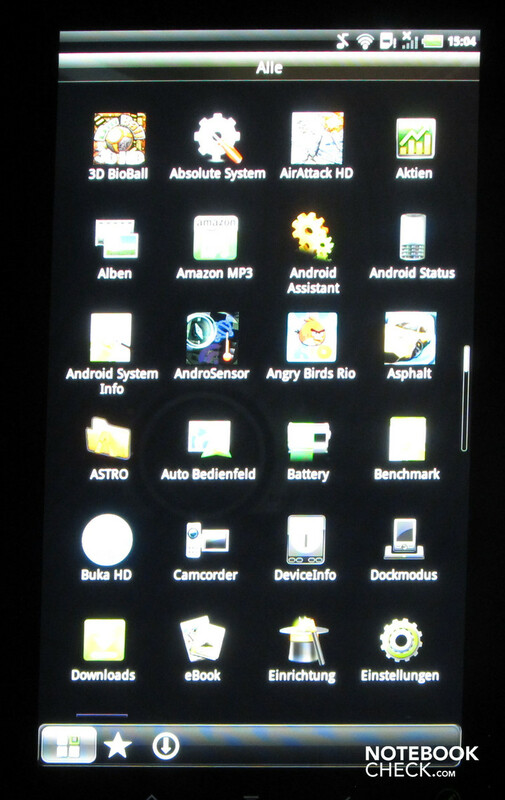 These three control fields are located at the screen's bottom in the landscape mode and have a backlight. They "move" when the device is turned around into the portrait mode and are then at the tablet's bottom. The other three control fields, which are now at the screen's side, are disabled in this position, just like their backlight. 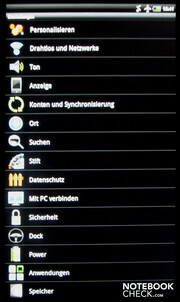 There are a total of seven sensors in the HTC Flyer, which can be used in relation to the application. The accelerometer, for example, responds to the tablet's position and detects all three axes. These positions are used especially within games. The sensors can also be used in other applications, such as a water level. 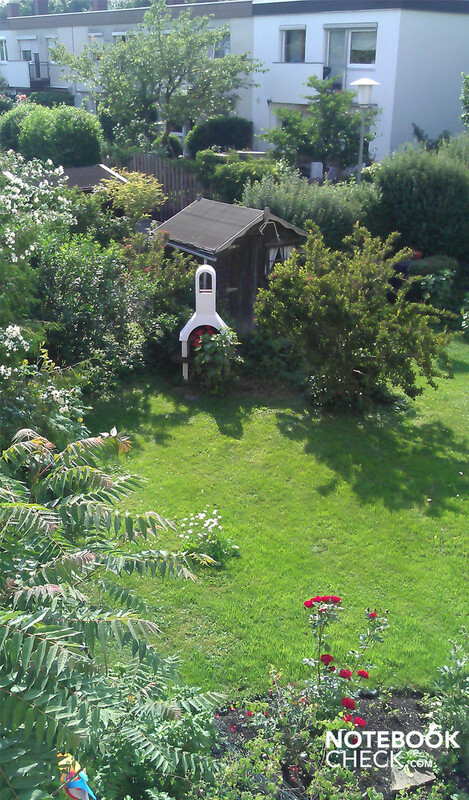 The lighting conditions are determined by the webcam. This sensor makes it possible to adjust the brightness automatically. Other sensors determine the Earth's gravity field (compass), serve localization or give battery state information (charge status, temperature). Noise levels can be determined via the microphone. 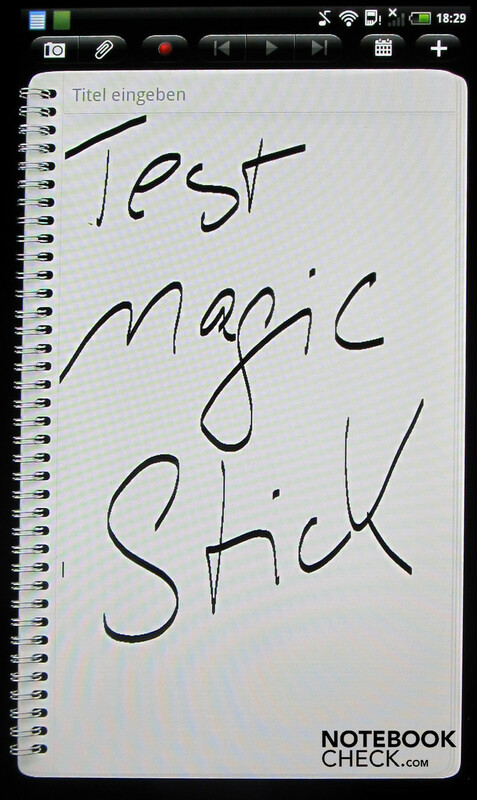 HTC and its "Magic Stick"
A digital stylus is included for the Flyer as another input device. You can write notes, draw pictures or highlight text in color with it. Sketching proves to work very smoothly with the pen. Many various brushes, colors and patterns can also be chosen in the menu. 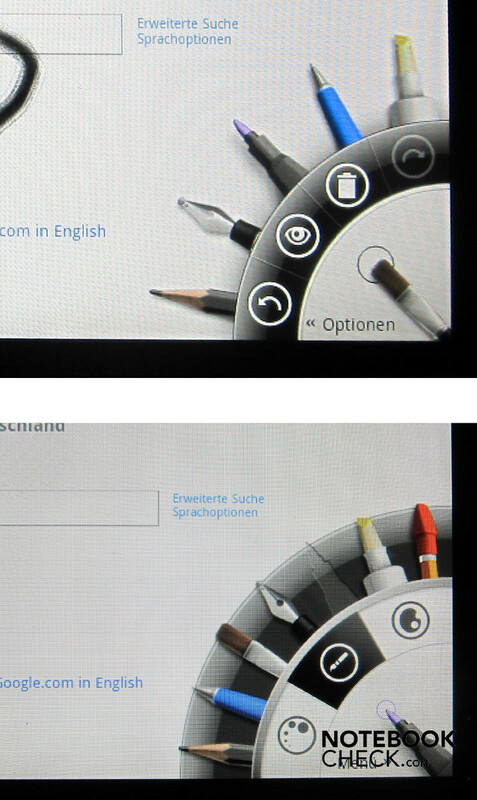 The stylus and its "artistic function" can be used in almost every application. Alike Nintendo's game console, you can edit, manipulate or comment your pictures. Notes via stylus can even be written within websites, menus or emails. The pen can also be used as a marker within text sections. 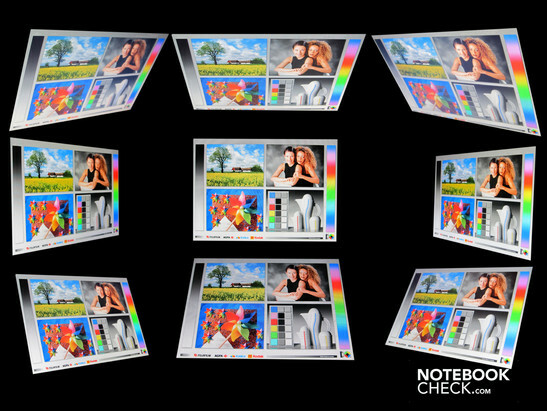 The LC display has a screen diagonal of 7 inches (17.78 cm) and a resolution of 1024x600. The touchscreen can reproduce 16.7 million colors at a dot density of 170 dpi. 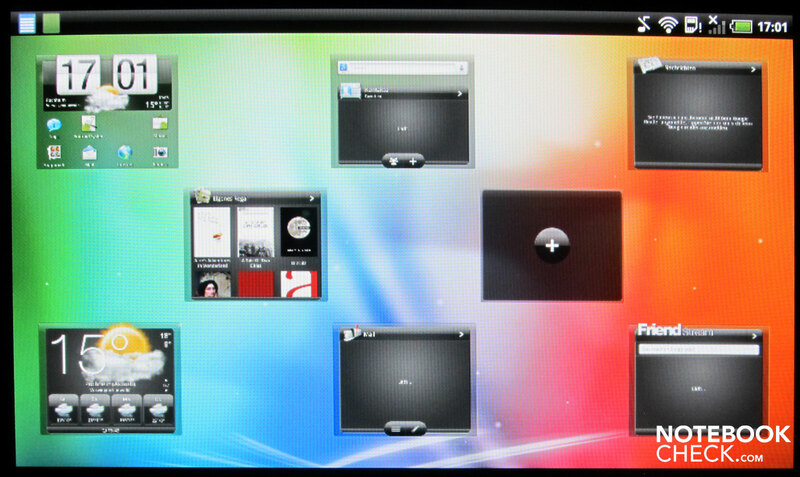 The capacitive screen allows you to play games or write emails on the HTC Flyer and control it. 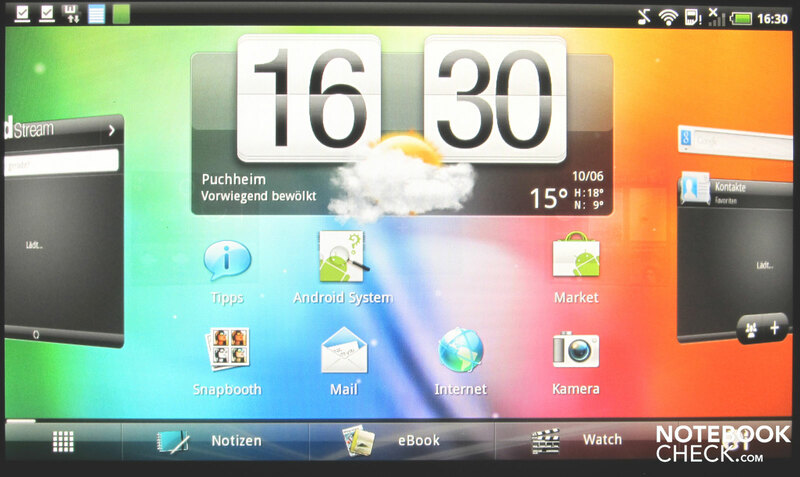 The screen supports multi-touch inputs, such as rotate, zoom in or out of websites or pictures, with the usual gestures. 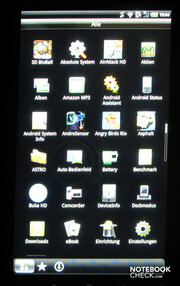 The screen content adjusts to the device's position and rotates from landscape mode to the portrait mode when the HTC is turned. Screen content rotation can also be disabled in the settings. The reproduced colors on the Flyer make a very saturated impression. Our measurements resulted in a maximum brightness rate of 352 cd/m2. The brightness decreases towards the upper left corner, though. The illumination is 87%. 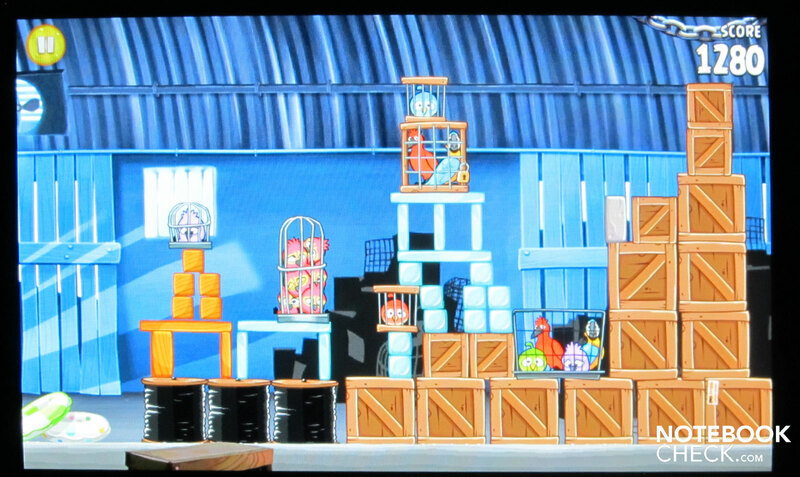 The average of this display is good 327:1 cd/m2. We measured a black value of 0.44 Candela per square meter. Thus, the measurement adds up to a maximum contrast ratio of 791:1. 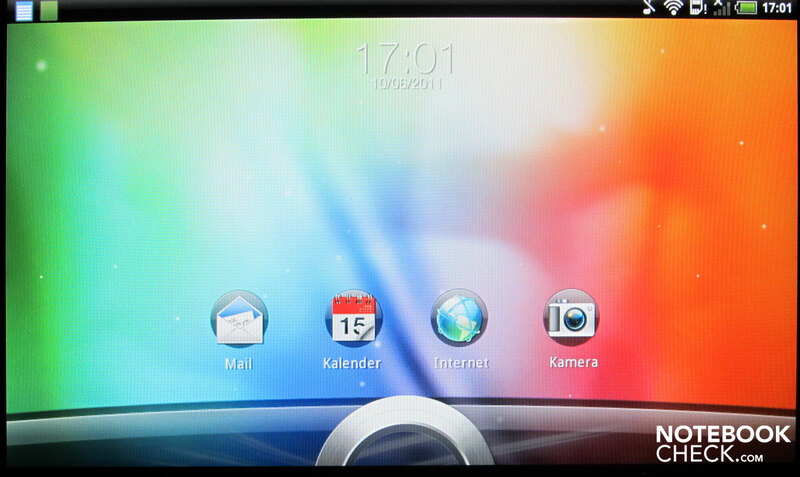 The HTC Flyer's glossy screen mirrors a lot of the environment in outdoor use. Aside from the usual self portrayal, direct sunlight is lethal for the display content. Watching videos or simply reading emails is particularly agonizing. Moreover, the contrast and colors suffer. They fade faster than during indoor use. 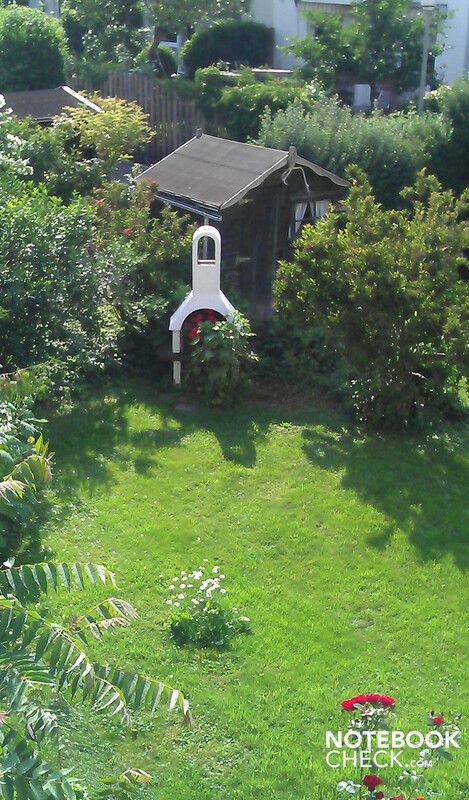 A shady place, for example in the beer garden, only remedies this to an extent. The SLCD screen's content is well-legible from almost every viewing angle on the Flyer. There wasn't anything to complain about in the standard test angle of 45 degrees. All details and colors were well visible in this angle – even when the tablet was tilted further towards the back or front. All screen contents are still well-readable at 85 degrees. The content becomes illegible when the reflections on the display multiply themselves. However, the picture doesn't invert or fade. 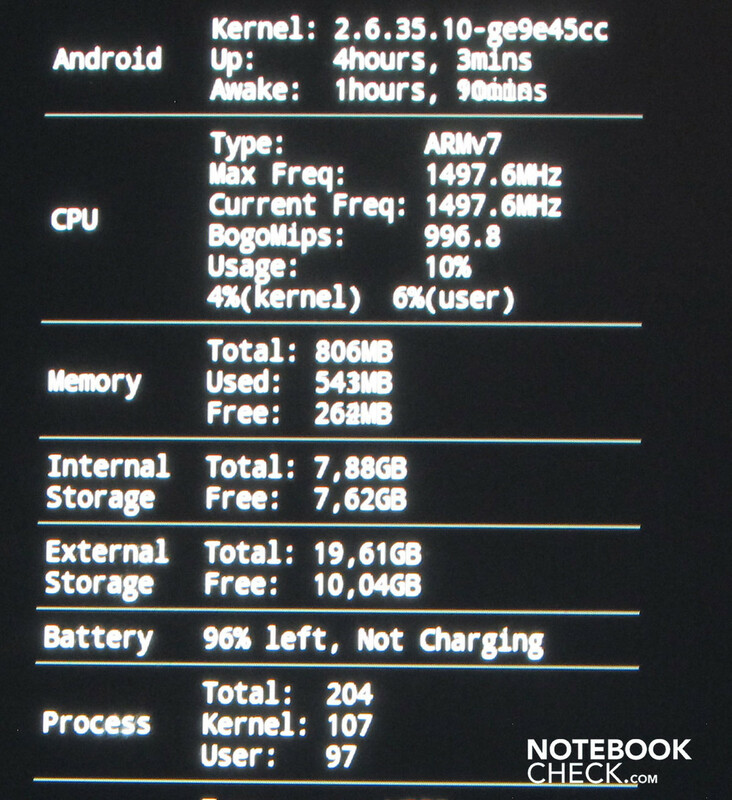 An ARM v7 CPU, model Qualcomm Snapdragon MSM8255 with a maximum clock rate of 1.5 GHz, works inside the HTC Flyer. 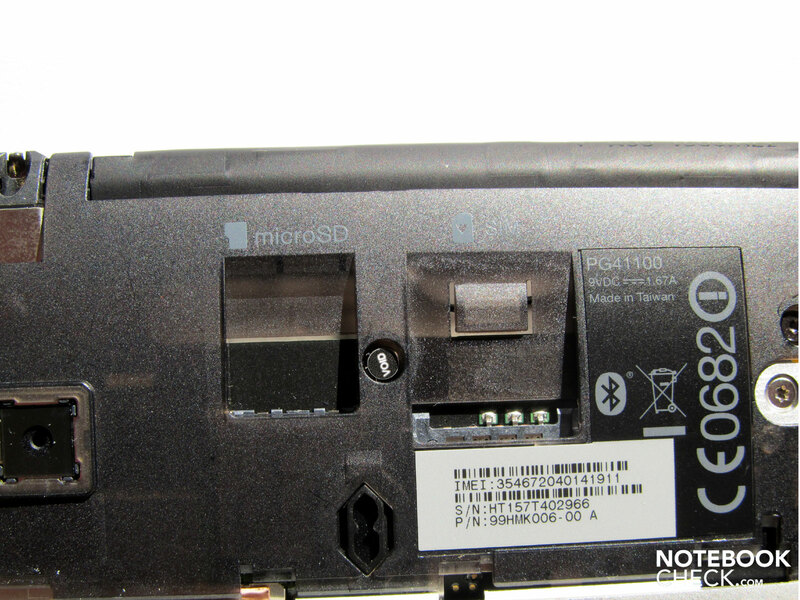 The Snapdragon chip is also responsible for the tablet's graphics output. The Qualcomm Snapdragon MSM8255 is a so-called "system on one chip" solution. This means that the most important hardware components of a computer are united on one single chip. A single core processor, a graphics chip and the GSM and UMTS modules are on this one chip solution. Until now, the Qualcomm Snapdragon MSM8255 was favored for use in modern smartphones. The manufacturer states the system's processor core rate to be 1.5 GHz. 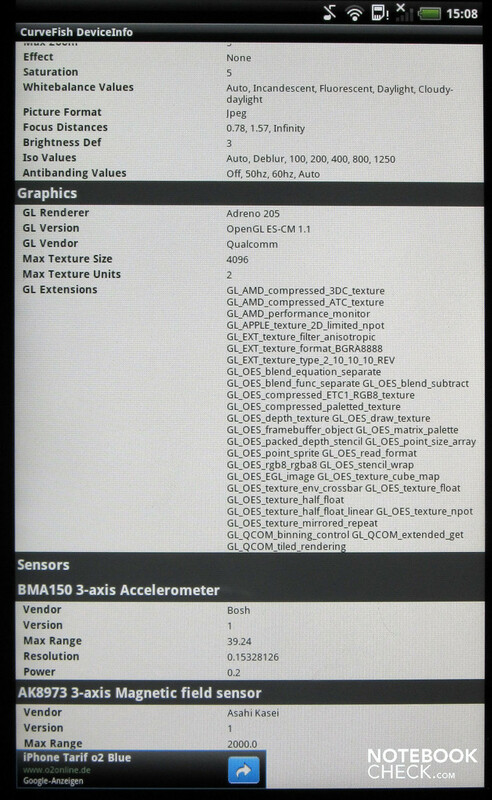 As we have already noticed in other tablets, the Qualcomm Snapdragon MSM8255 works with a low clock depending on the requirements. This means the clock rate orientates itself autonomously on the requirements of active programs. The processor clocks down to 266 MHz when only little computing performance is needed. The clock rate is increased in graphics-heavy application and reaches its maximum at 1500 MHz. The Qualcomm processor has a RAM of 1 GB available. 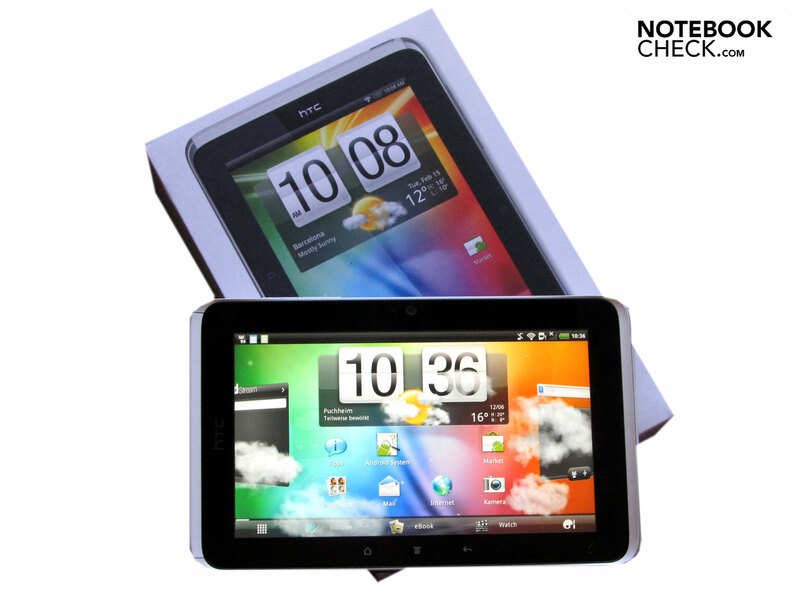 In the executed benchmarks, the HTC Flyer is almost on a par with the 10 inch tablets that we were allowed to review over the past weeks. 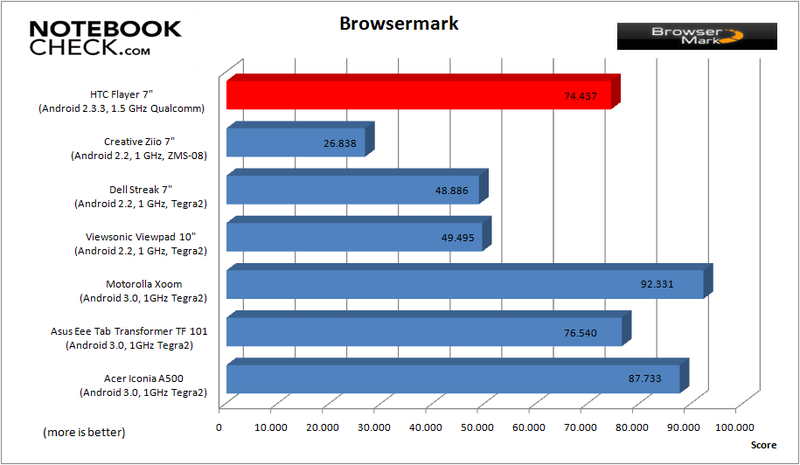 The HTC Flyer clearly surpasses the 7 inch devices from Dell or Creative in Browsermark. 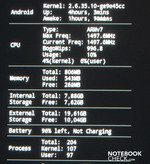 However, the HTC device didn't quite reach the rates of Asus' Eee Tab Transformer. 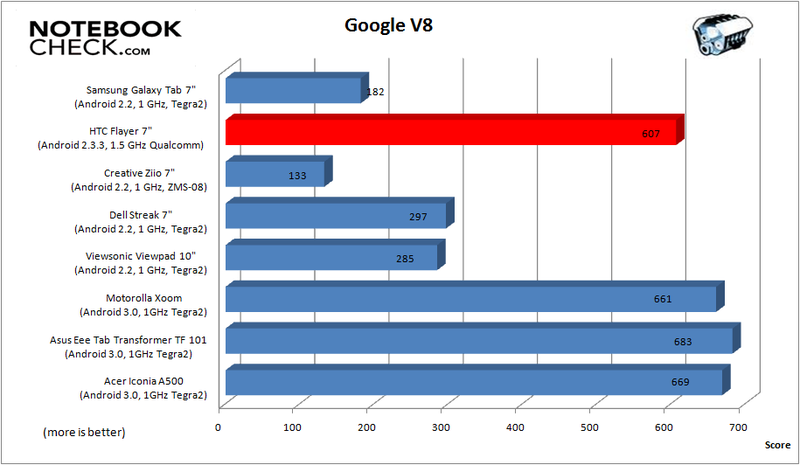 The Flyer doubles the rates that we measured in Samsung's Galaxy Tab, Creative's Ziio or Dell's Streak 7" in Google V8. 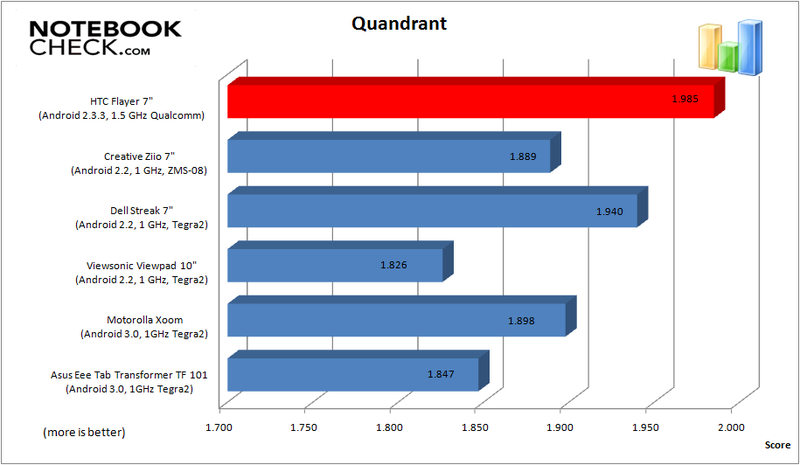 The HTC device is almost on a par with the 10 inch counterparts from Asus, Acer and Motorola in this benchmark. 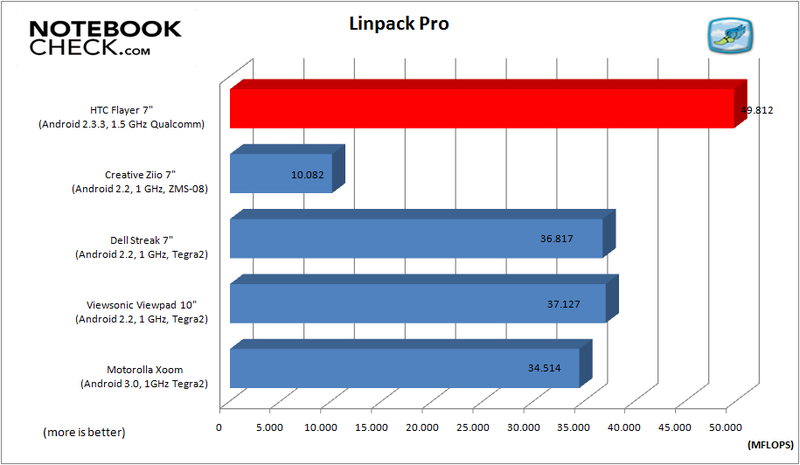 HTC's tablet left the other test candidates far behind in the Linpack Pro test and reached a new top rate with nearly 50000 MFlops. The HTC also presented itself from its best side in the program, Quandrant. It also reached the top here with 1985 points. 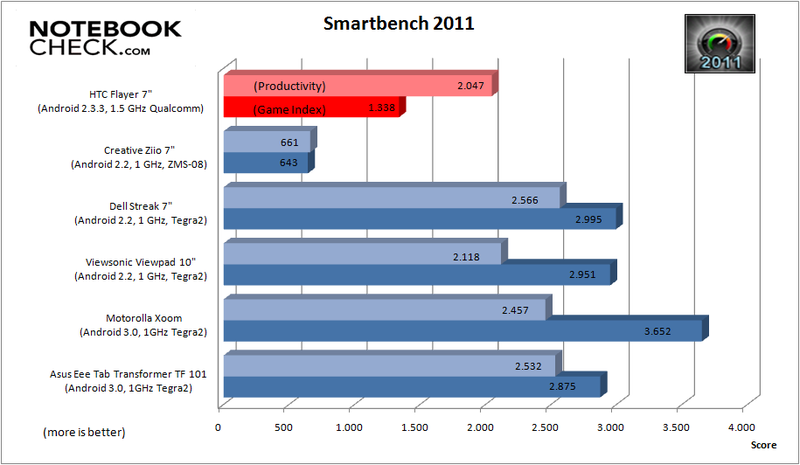 The device faltered a bit in Smartbench 2011 and only managed second place with 2047 (productivity), respectively 1338 points (game index). 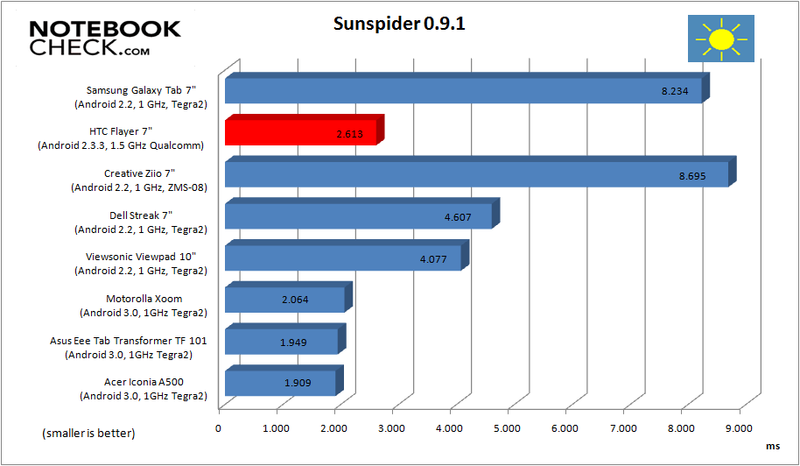 The HTC test device again placed itself among the better tablets in the Sunspider benchmark test run through – clearly in front of all 7 inch devices and slightly behind the 10 inch devices that were tested. 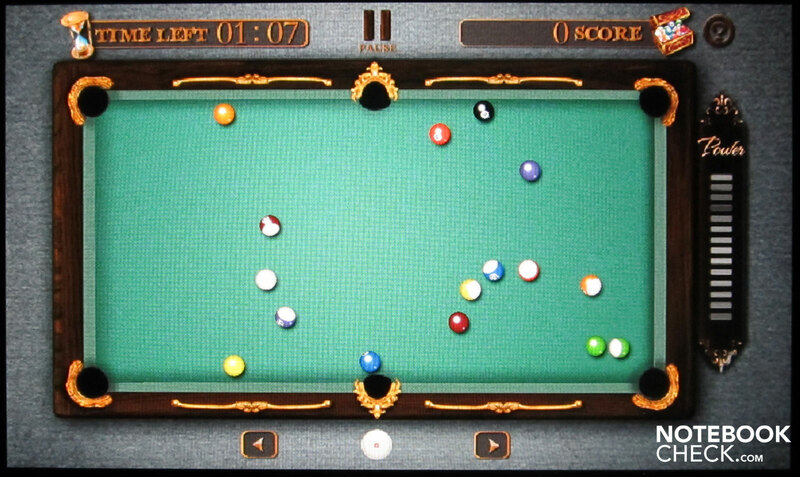 Tablet as a Game Console? The 7 inch HTC Flyer seems to be the perfect travelling companion for rendering music, pictures and videos especially on the go. The device would also serve well as a game console. 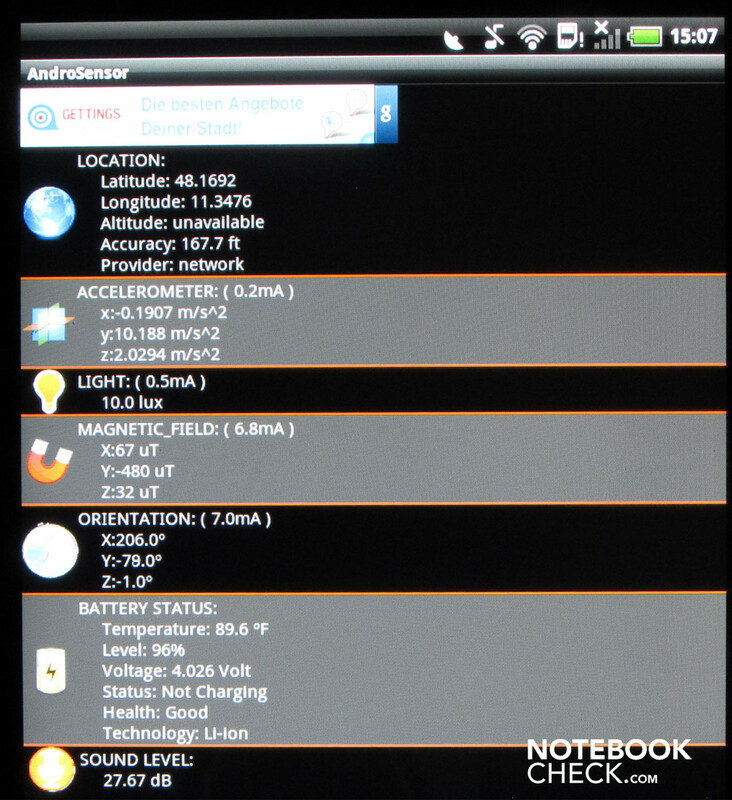 A variety of apps and games for the Android 2.3.3 operating system are available with access to the Android Market. 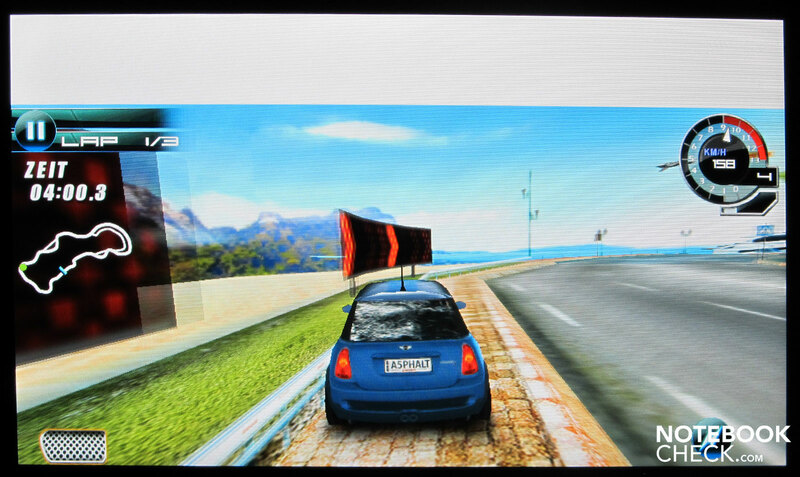 As we have already noticed in other tablets, not all games run in full screen mode. 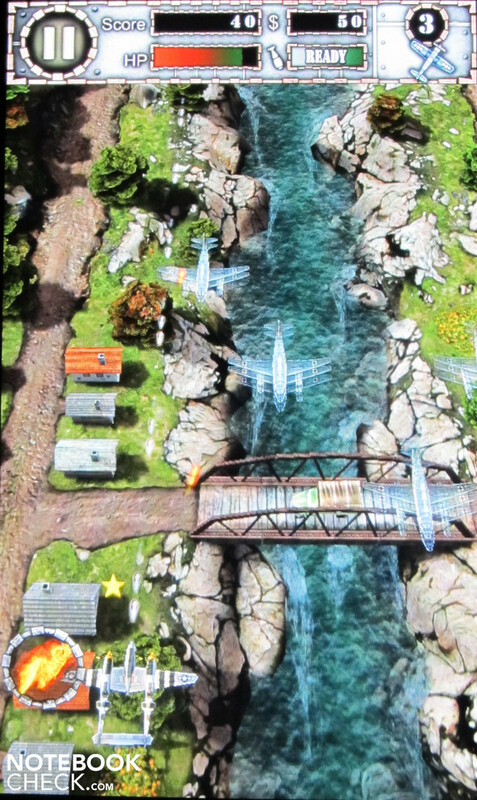 This is particularly due to the fact that few games have been designed for smartphones. 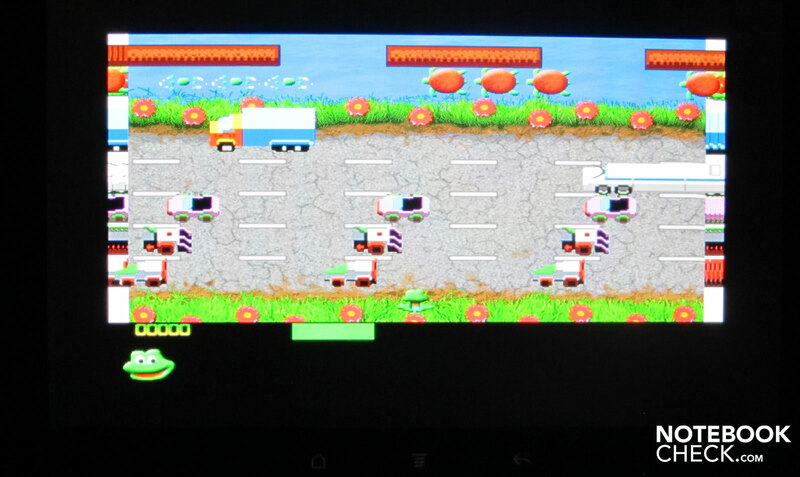 Also, there are hardly any games that have been specifically developed for tablets and their higher resolutions. 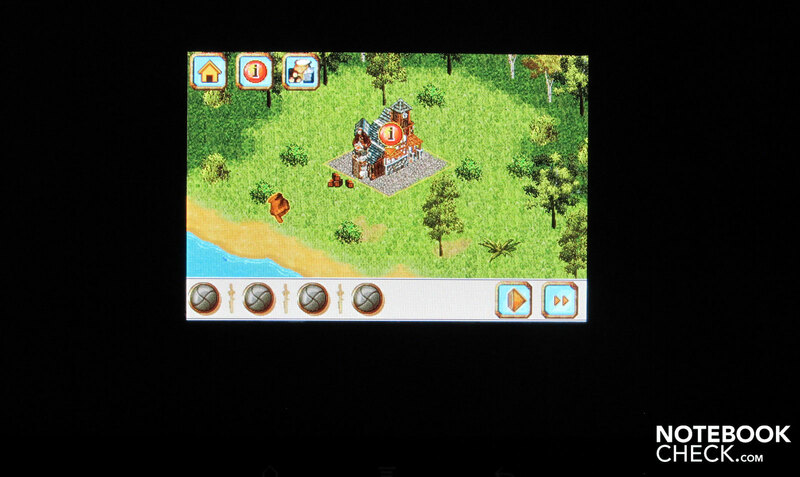 Thus, it’s a bit of a game of chance if the entire screen will be exploited within a game, or not. The game check shows that even the newest games don't inevitably fill out the screen. Even the addition "HD" is not a guarantee that the screen will be exploited in its entire height and width. The Settlers aren't playable in this "size"
It doesn't exactly look good for your videos, either. 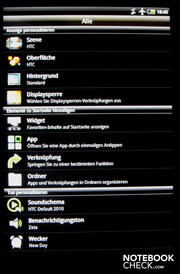 According to the manufacturer, the HTC Flyer supports the most common video formats (3GP, AVI, WMV and Xvid), but only in SD resolution. The only remedy is to download an appropriate player. Our test videos were all recognized, with exception of the MOV file, and ran smoothly. Even Full HD movies (H.264 /MKV) ran with the app zPlayer V1.8a. However, we occasionally experienced a freeze screen for several seconds while the sound continued to play. You have direct access to a great number of trailers and blockbusters with the online video service "Watch" (provided that you have a good Internet connection of course). You can rent or even buy the available movies. The online video shop offers mostly classics that have recurrently been seen on TV. But the latest movies, such as "The Social Network", are also in offer. The movie rental fee is 3.99 euros in most cases. You have to dig deep into your pockets when you want to buy a movie: "Spiderman 2" costs around 9 euros, "The Social Network" 13 euros. Classic movies, such as "The Warriors" also cost 9 euros, "Top Gun" and "The Godfather" 12 euros each. Buying the DVD would be cheaper in most cases. The installed chip's power loss is dissipated over the flipside, which is made of aluminum to the largest part. The temperature is well noticeable even in idle mode. The Flyer gets even a bit warmer during load. The measureable temperature on the entire flipside increases to over 30 degrees Celsius. (+) The average temperature for the upper side under maximal load is 30.8 °C / 87 F, compared to the average of 30.7 °C / 87 F for the devices in the class Tablet. (+) The maximum temperature on the upper side is 32.2 °C / 90 F, compared to the average of 34.8 °C / 95 F, ranging from 22.2 to 51.8 °C for the class Tablet. Two speakers are installed into the Flyer for audio output. They are located on the flipside's lower area. The sound is rendered quite adequately in medium volume. However, the sound gets tinnier the louder it is set. The audio output is equally good in every volume setting via the headphone jack. 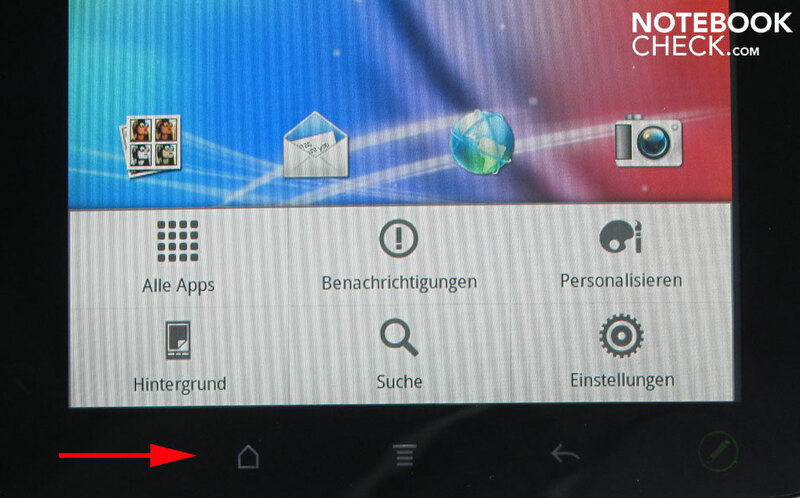 The volume is either controlled directly on the HTC with both controls, or within the operating system's settings. The main question of every portable device is: How long does the battery last? 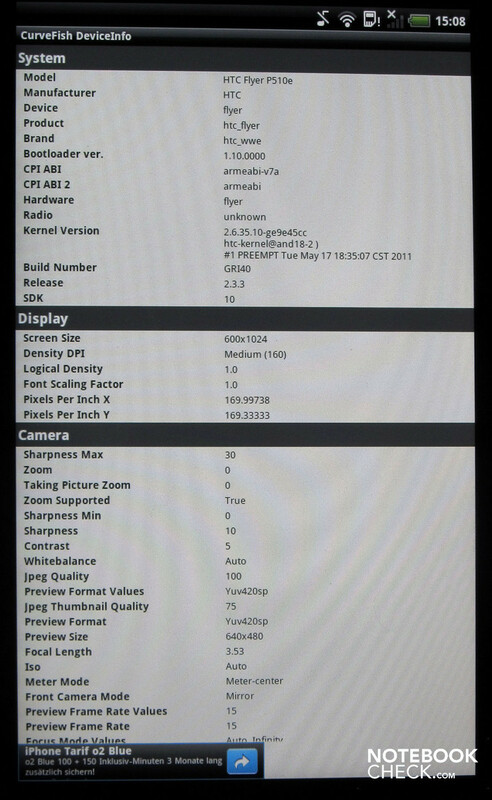 We of course wanted to see the facts for the HTC Flyer. 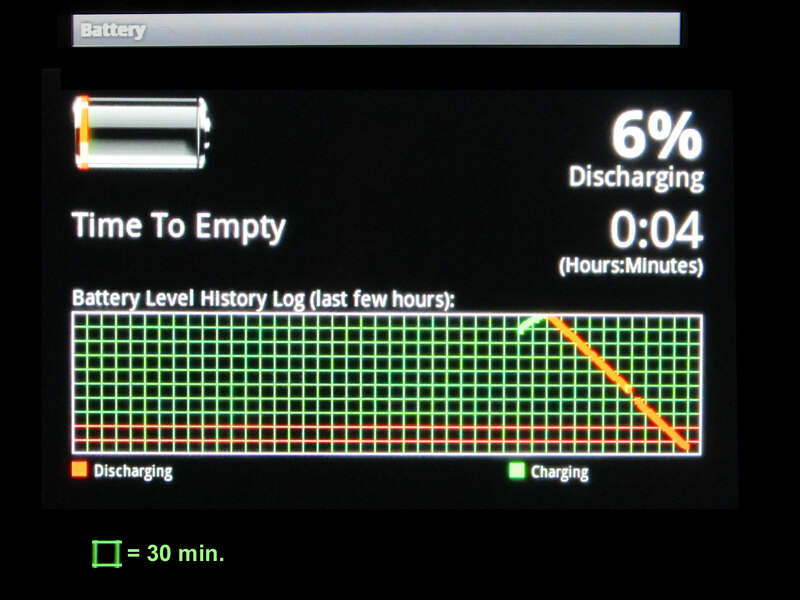 The lithium ion battery lasted 638 minutes, so almost 11 hours, in idle mode. This means without WLAN / Bluetooth and with minimum display brightness. However, the battery is already drained after 5 hours and 11 minutes in the Reader's Test (minimum brightness, turning pages via WiFi). 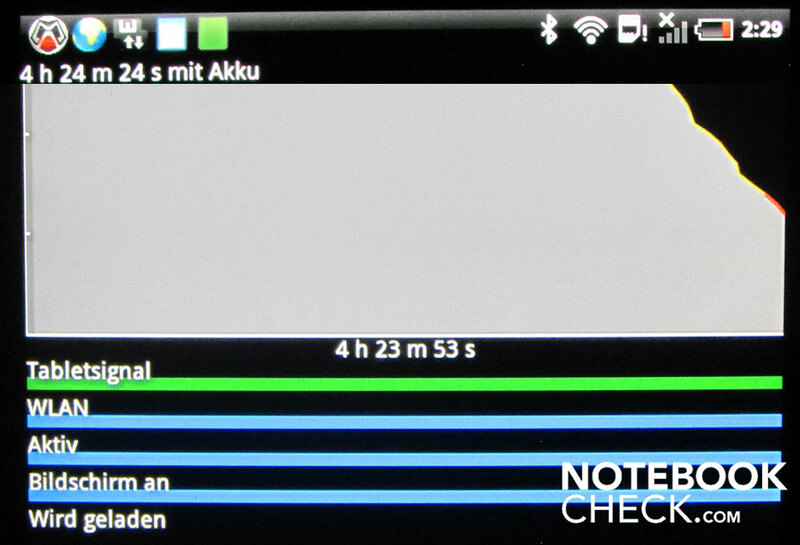 The HTC Flyer had to be charged after 383 minutes in the WLAN test (practical surfing with modified display brightness). It declines even faster when the Flyer is used for gaming. The battery was drained after almost 4 hours (exactly 3:48 hours) in a load situation and the Flyer turns itself off. The battery lasted for 488 minutes in use as a video player with modified display brightness. The movie night that begins in the afternoon will thus not be a success. 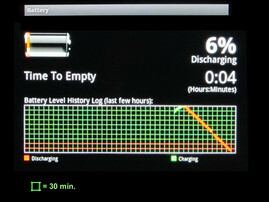 A drained battery needs almost 3 hours until it is charged to 100 percent. 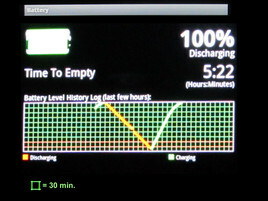 The power consumption while charging is minor and was assessed to be 5.3 watts during load. 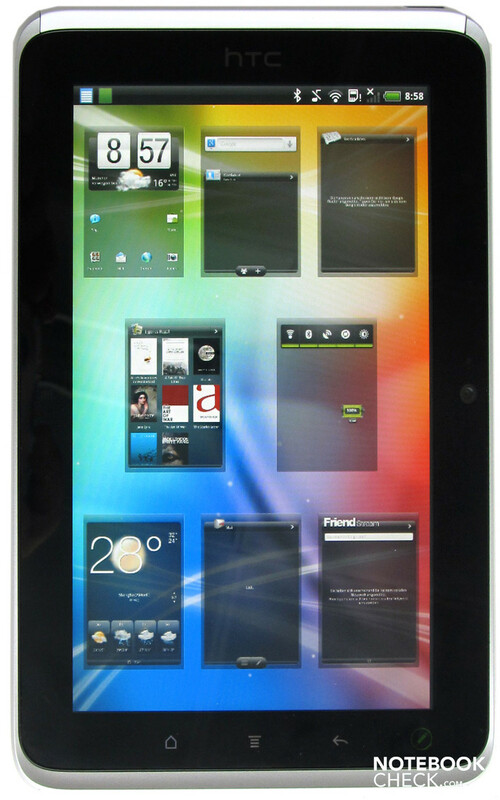 the HTC Flyer is in the midfield in comparison to other tablets. The HTC Flyer looks like an oversized smartphone at first. 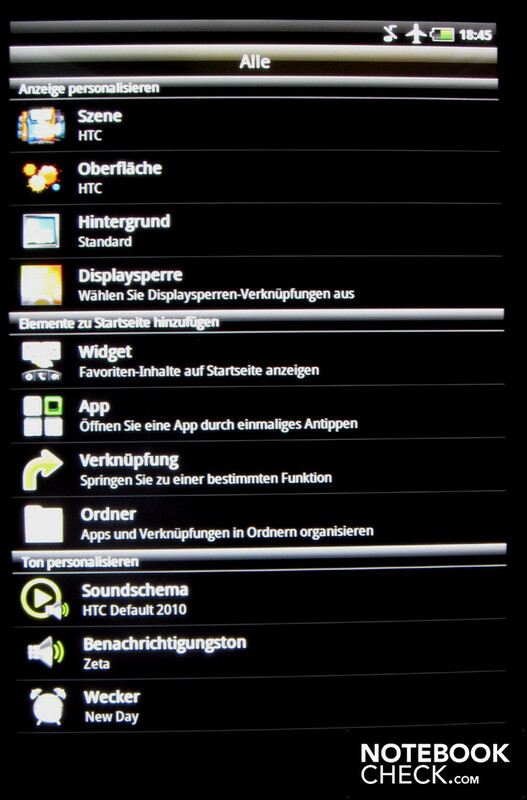 We quickly found our way around in the menus due to the familiar HTC Sense interface. However, we were disappointed as we looked closer at the workmanship and the retail price. The retail price of 667 euros is likely a joke – at least that was our first thought. Almost 700 euros for a 7 inch tablet? That simply has to be an error. However, price research didn't cough up any cheaper offers. 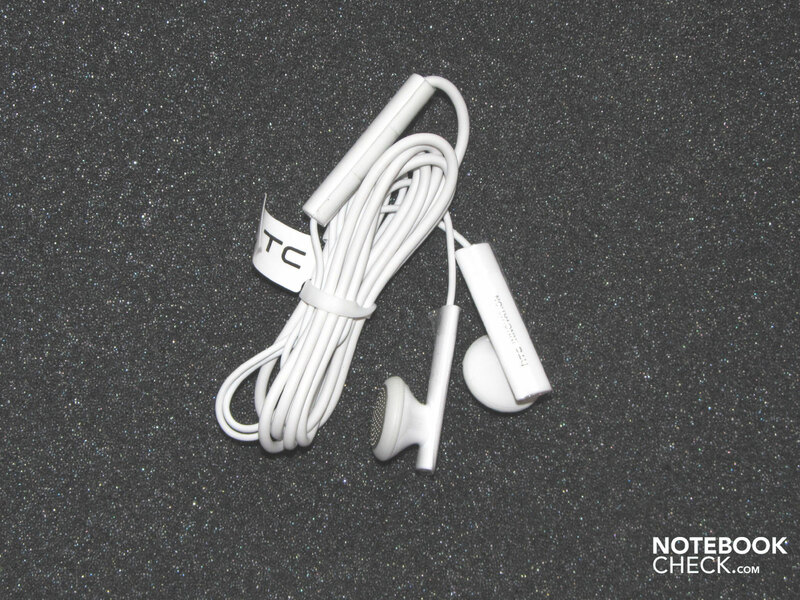 What does the HTC Flyer have that others don't offer for a lot less? The device really does offer quite a bit that other 7 or 10 inch tablets don't have. 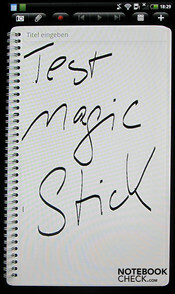 For example, the Magic Stick, that can be used as a sketching device like in the Nintendo DS. The navigation software appears to be included in the retail price because all maps can be downloaded and installed without a mention of a limited time. 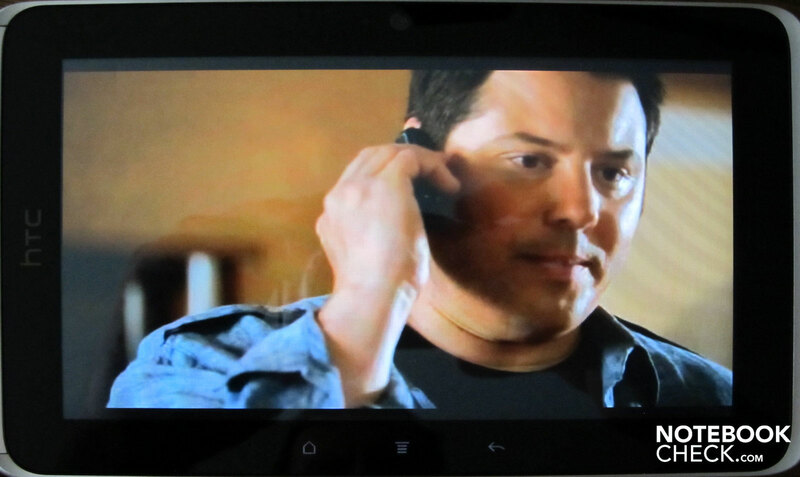 The tablet mutates to a portable video player with "Watch" and you can rent or buy movies in the online video shop. The prices in the video shop are exceedingly high, though. Rental fees are around 3 to 4 euros, and buying a movie costs between 6.99 and 13 euros. Internet access is managed either via WiFi, UMTS (3G) or via the USB port. The PC has to have the according software installed for the latter alternative. There are even more innovations concealed in the device. The Flyer can transmit videos via WiFi to an external video player, the 3G Internet connection can be opened for other PCs / notebooks. 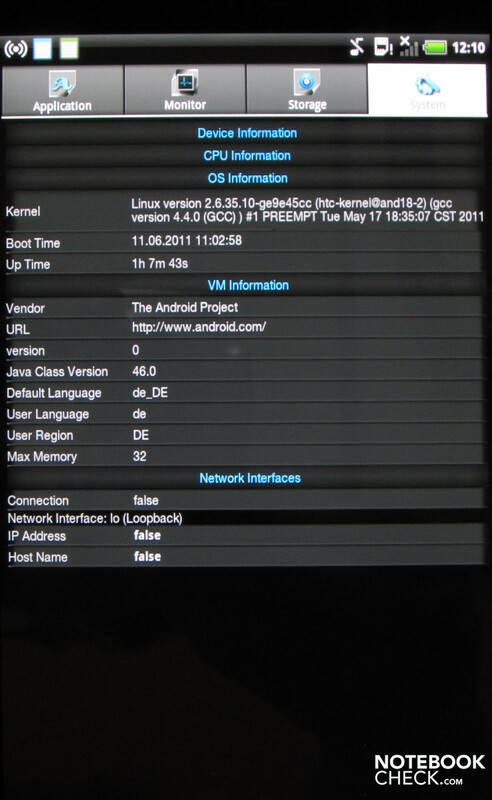 The Flyer is used as an access point in this case (tethering). The tablet can even be used as a PC modem this way. The HTC's functionality is in fact enormous, as the price of 667 euros already indicates. The device is quite handy with the dimensions of 12.9x195x125 mm and 430 grams. The display's color brilliance is outstanding and even the viewing angles don't leave you wanting more. 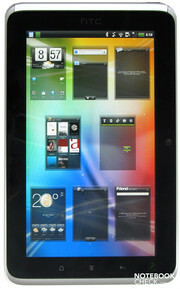 The Flyer's quality is comparable to that of the Motorola Xoom tablet. Our only wish would be that the tablet soon gets (a lot) cheaper. We noticed the controls very positively in the test. They also adjust to the display's positioning. We didn't miss much in the HTC Flyer. A HDMI port would add value to the device, but it wouldn't have an impact on the total score. The battery life of up to 11 hours is impressive. On the other hand, the battery is drained after only almost 4 hours in load situations. 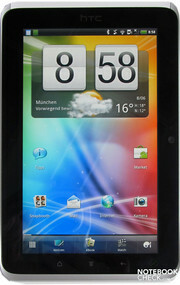 The HTC Flyer left the competition in the 7 inch field far behind. 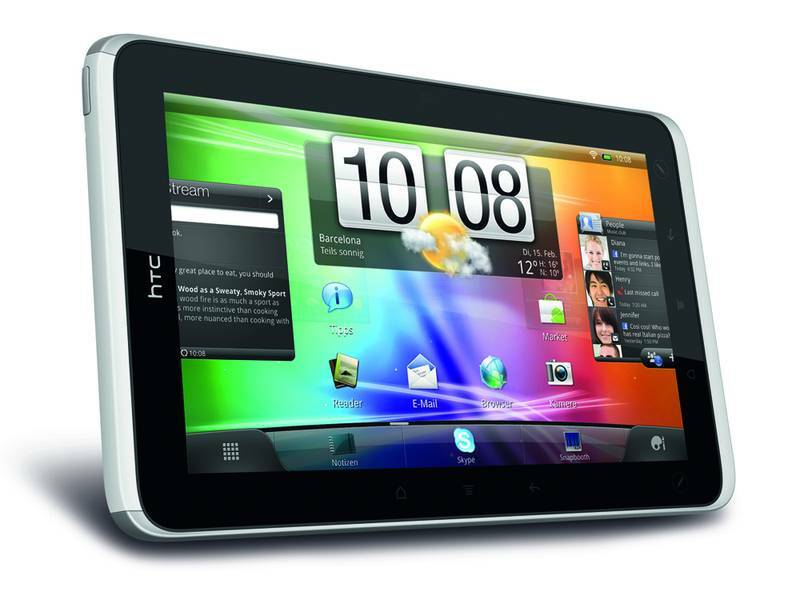 The HTC tablet is currently the fastest of its kind in the 7 inch sector. 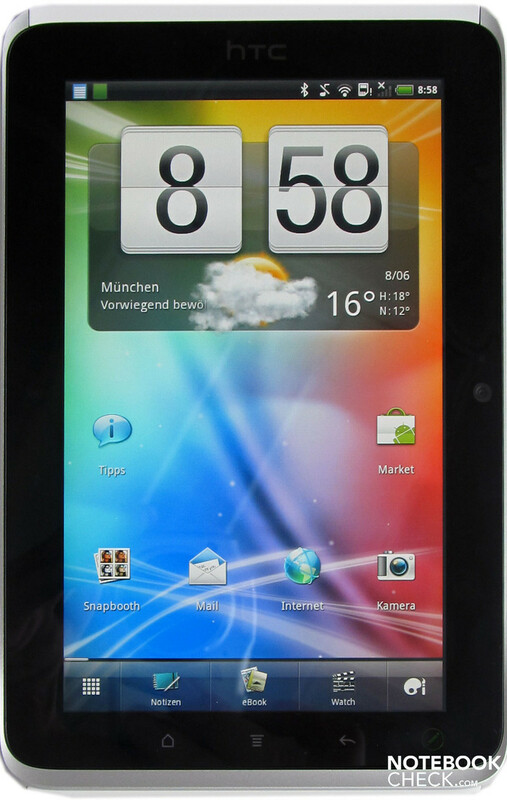 Possible opponents: Dell Streak 7", Samsung Galaxy Tab.